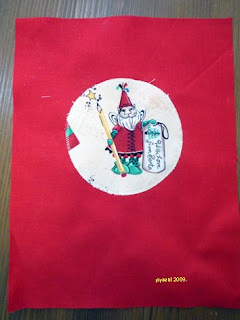 Another scrap busting project, this one I will enter into the Sew Mama Sew contest. You can make this any size as long as the front and back pieces are the same. 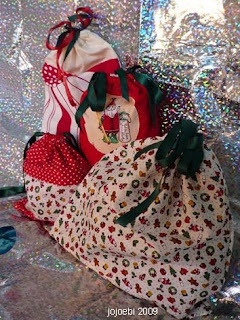 First, decorate the front of your bag, or if you are using Christmas fabric you can leave it plain. I cut out a circle the raw edge appliqued it to the front. 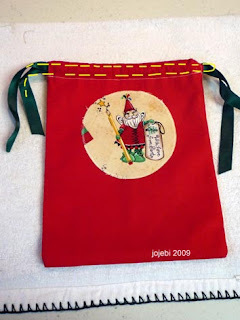 Next, take your white piece of fabric and use a fabric pen to stamp to and from for the bag label. I decided to make a pile of these bags so I carved myself a rubber stamp, the first one I made I used a fabric pen and wrote the year on too. 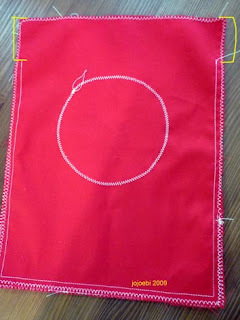 Then sew the label strip to the back piece of the bag. 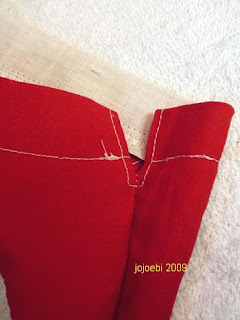 Overlock the edges on both pieces, I don't have a proper overlocker, you could use a zig-zag stitch too. 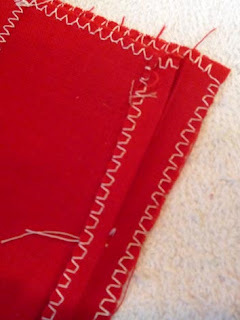 Put the two pieces, right sides together, you need to sew the two pieces together but leave 2" unstitched at the top on both sides, marked in yellow, these will be folded over to make casing for the ribbon. 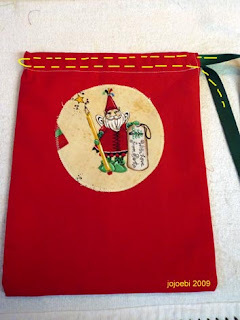 This is a little tricky at first, stitch down one side, across the bottom and up the other, you can see the stitching just inside the yellow lines. Repeat for both sides of the bag. 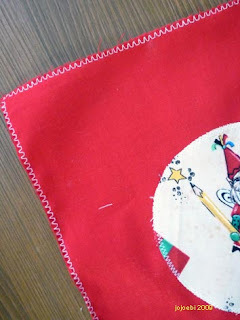 Fold the top over and press, stitch 1/4" from the overlocked edge so you end up with tube or casing to thread the ribbon through. Turn right side out and press. 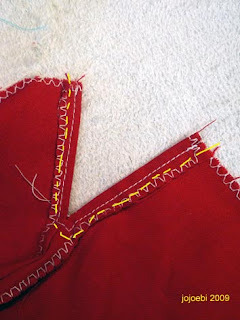 Take a long piece of ribbon, starting on the right, thread it through the front piece of casing, when you get to the lefthand side loop it round and thread it through the back, both ends of the ribbon should be on the right. Take another piece of ribbon and thread it from the left. 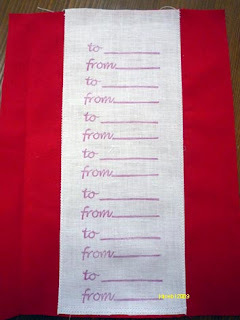 Write who your gift it for and who it is from on the back, pop your gift inside, pull the ribbons and tie. 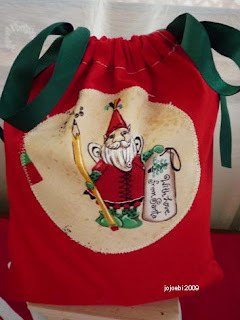 I haven't even bought any Christmas gifts yet so this bag remains blank for now! I have made a pile of these in different sizes and shapes. This is so cute. I didn't want to give up the pretty paper, but I could with this. This looks like a fun idea! I love the to: from: because you can really see where it travels! Thanks for sharing! These are such a great idea. Thanks! i have seen this idea before and think it is a great idea. I just don't so unfortunately, i want to learn though... Love the things you make! I have the fabric all ready to go and was just trying to work out how to do this! You saved me so much time! Thanks so much. 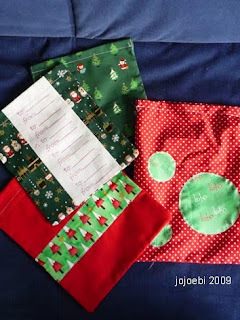 some of this fabric I bought 2 or 3 years ago with the intention...I am glad I finally got round to it, I have some nice fabric which would be good for birthday bags too. Very cute. 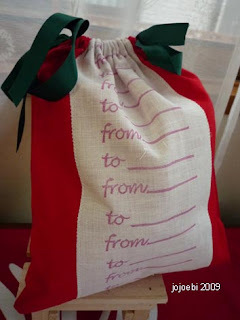 I hadn't thought to include the to/from as part of the bag... we may add that to our Xmas bags this year. Thanks! I really like the idea of the "to and from" on the back. It adds another fun element to gift giving!